Bold Type Books, 9781568589084, 272pp. 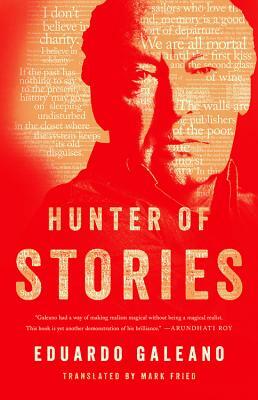 Comprised of all new material, published here for the first time in a wonderful English translation by longtime collaborator Mark Fried, Hunter of Stories is a deeply considered collection of Galeano's final musings and stories on history, memory, humor, and tragedy. Written in his signature style--vignettes that fluidly combine dialogue, fables, and anecdotes--every page displays the original thinking and compassion that has earned Galeano decades and continents of renown. Eduardo Galeano (1940-2015) was one of Latin America's most distinguished writers. A Uruguayan journalist, writer, and novelist, he was considered, among other things, "a literary giant of the Latin American left" and "global soccer's preeminent man of letters." He is the author of the three-volume Memory of Fire, Open Veins of Latin America, Soccer in Sun and Shadow, The Book of Embraces, Walking Words, Upside Down, and Voices in Time. Born in Montevideo in 1940, he lived in exile in Argentina and Spain for years before returning to Uruguay. His work has been translated into twenty-eight languages. He is the recipient of many international prizes, including the first Lannan Prize for Cultural Freedom, the Casa de las Americas Prize, and the First Distinguished Citizen of the region by the countries of Mercosur. Galeano once described himself as "a writer obsessed with remembering, with remembering the past of America and above all that of Latin America, intimate land condemned to amnesia." Isabel Allende, who said her copy of Galeano's book was one of the few items with which she fled Chile in 1973 after the military coup of Augusto Pinochet, called Open Veins of Latin America "a mixture of meticulous detail, political conviction, poetic flair, and good storytelling." nights) envisioning a finer world for all."